Welcome to the 4 part series that explores the 4 Stages of the classic commitment-phobic relationship. People often ask us why we are so passionate about the topic of commitment-phobia. 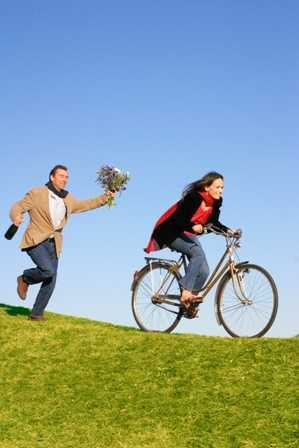 Commitment-phobia is the leading cause of relationship breakup in society today. It is also the culprit of the worst form of heartbreak because it does not offer closure, or even clarity. Without understanding the indicators of commitment phobia, it makes it virtually impossible to truly learn from your relationship mistakes without creating the confusion that sabotages the trust and ability to love again. This 4 part series will explain step-by-step, how a warm heart turns into a cold shoulder. The hot pursuit: you have been targeted. The gun goes off and the chase begins! Your pursuer is obviously hooked and makes it their personal mission to win you over. They are overt with their intentions, telling you whatever you need to hear to reciprocate their longing for your affection. No mountain is too high or river too deep for this persistent romantic. How long can this possibly go on? As long as it takes to win your heart and most importantly, they reach the point where a FULL commitment is required. It could take years, or months or days. How easily can you be swept off your feet? Please note that these may also be the signs of a healthy relationship – the difference is that everything moves at an accelerated pace or with greater intensity. 1. They often come on strong and make you wonder “Why is this person so into me?” They are definitely more interested in you than you are in them. 2. In an unrealistically short time frame, they tell you that there is something unique and special about you and that they have no doubts about going forward. 3. They have a rocky history of past relationships, but let you know that things will be different with you. 4. They do everything to impress you, whether it is spending money, presenting gifts or sharing their “true” feelings. 5. They will act vulnerable and act as if they need the relationship more than you do. 6. They give you every sign that they are through with fleeting relationships and looking for the “one”. 7. They are willing to go out of their way to please you or make you think they have similar interests. 9. They openly talk about the future and make “we plans”. 10. They act as though you are a priority in their life. 11. They seem sensitive to your issues or causes and puts down others who don’t support your beliefs. 12. They do everything in their power to convince you to trust them…. and eventually you do. 13. They convince you to make an emotional and / or sexual commitment to them. This list describes the “pursuer” in a commitment phobic relationship. There is also an “avoid-er” who tends to resist the advances to avoid getting close too quickly. Without the imminent fear of total commitment, this dance exacerbates the pursuer and makes them feel safe to intensify the chase. Some of these points are also elements in a healthy long term relationship – calling to “just say hello” for instance. Note that this is only the first stage of a four part pattern of relationship sabotage. You will see the difference in the next article that discusses the first signs of panic. Part 2 – The Middle: Now that they have you – they feel scared. 1. Have I exhibited these traits in previous relationships? 2. Am I a chameleon, changing myself into what others want me to be? 3. Do I like “the chase” and get energized by making others fall for me? 4. Do I get scared and pull back when it’s time for a true commitment? 5. Is there a part of me that I am withholding in a relationship? Do I avoid being completely authentic, never letting anyone know who I really am?